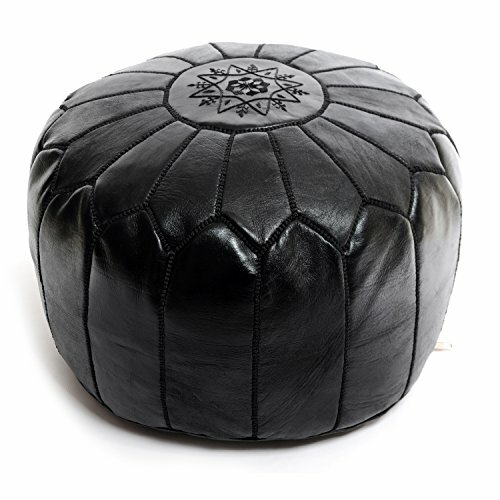 Moroccan Poufs are wonderful leather ottomans used for seating. This type of furniture can go by many names, such as hassock, tuffet , and of course ottoman. Outside the United States it's more commonly spelled "Pouffe". These lovely round ottomans have many different uses. For example it's an excellent foot stool or foot rest and a lovely piece of furniture or housewares; however it's mainly used for seating. A Moroccan Pouffe makes for an excellent piece of home decor. We hand This hand stitched Black leather pouf with Black silk embroidery will make that additional impact.